On Friday night we drove through City of Rocks to see if all the camping spots were, indeed, filled up. It seemed they were, so John drove out toward a place called Bostetter that he had camped at many times as a kid. We took the wrong road by half a mile and ended up severely regretting it. We drove for three hours or more on this tiny, one-lane, badly rutted dirt road that wound around in the middle of nowhere while we got hungrier and hungrier (foil dinners were in the ice chest, waiting to be cooked over a campfire) and more and more tired, sad, and frustrated. Many tears were shed. (The horrible “road” we were on was called Trapper Creek Road, apparently, and I told the kids I forbade them to ever mention that road again. Too many bad memories!) Because the road was so bad we could only go 15 miles an hour or less, which made it take even longer. Finally…at long last…we were winding our way up into mountains (which was a good sign) and I spotted a lone brown sign with an arrow pointing to…Bostetter! Our cries of rejoicing filled the van. After another half hour or so we finally arrived. It was after 10pm and very dark and we were afraid there wouldn’t be any spots but luckily for us, there was one spot left! The kids and I gathered wood and built a fire while John set up lanterns around the area so we could put up the tent. Once that was finished we cooked the foil dinners but the fire wasn’t hot enough yet and we ended up cooking them on the camp stove. When they were done enough to eat we scarfed everything down, cleaned up a bit, and went to bed. It was VERY cold and we didn’t have near enough blankets. But we somehow made it through the night and were all awake before 6am the next morning, Saturday. We made breakfast—eggs, bacon, and toast (I cooked the toast on a stick over the fire…so much fun! )—and set off to go hiking. It was quite an overcast morning. We followed a wide track, then got bored with it after a half mile or so and crossed a stream on rocks to get to a more interesting area. Somebody was a chicken about stepping on these slippery rocks. Can you guess who? My only request was TREES!! Give me TREES! We headed up a steep, narrow trail among aspens and made it to the top of a high cliff/hill/mountain area covered in dirt, rocks, and very scratchy sagebrush (poor Bran! He was wearing shorts and got his legs scratched up). Nia was like a little mountain goat. She kept saying “Higher! I want to see the top!” and ran ahead of us all morning. The view from the top was marvelous. I wish my pictures weren’t so dark. But hey, they’re pretty good for a camera phone! We headed back down and were so exhausted/legs so sore that we barely made it back to camp before collapsing. John fell asleep sitting up in a camp chair and I crashed on the cot for a nap. 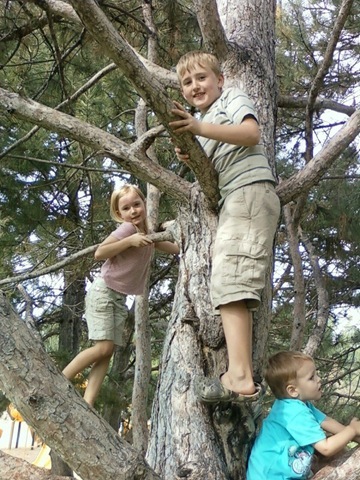 The kids had tons of fun running around in the bushes, finding sticks and playing. I wish they had this kind of surroundings on a daily basis. I miss my forests!! After a lengthy discussion later on, we decided to pack up and head back to Burley (on the right road this time). The rest of the afternoon/evening we spent visiting relatives and friends, and John’s aunt and uncle so kindly offered their home to us for Saturday night so we could take showers (heaven!!) and go to church on Sunday. We also got to see the Twin Falls temple for the first time. It was beautiful. I’m in a huge hurry right now. John came home from work last night stressed and exhausted and told me he took tomorrow and all next week off from work. So we’re now running around getting ready to head to Idaho for a fun weekend of camping! I did want to post quickly before I left, though, since I haven’t yet this week. Wow, what a busy week! I spent the majority of the last several days doing literally hours of cell phone research. My parents and some of my sisters and I have been in this 5-person family plan with Sprint for the last two years, and we were looking to upgrade our phones. My phone broke last week and was hanging by a hinge. :) Finally the hard work paid off and we found the perfect guy to go with—the Sprint store in the Toys R Us parking lot in West Valley. Brett was so awesome. He gave us a great deal on phones, discounts, and fees and made us very happy. My dad, my sister Kaari, and I all ended up getting the Samsung Exclaim phone. It’s GREAT! We love it. It’s unique because it has two slide-outs—a keyboard and a number pad. I got the pink one. 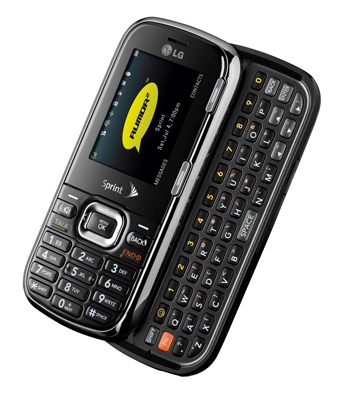 My mom got the LG Rumor 2, which has a keyboard slide-out, and my sister Kaatia got the brand-new Samsung Reclaim, which is an eco-friendly phone made from corn, if you can believe it. 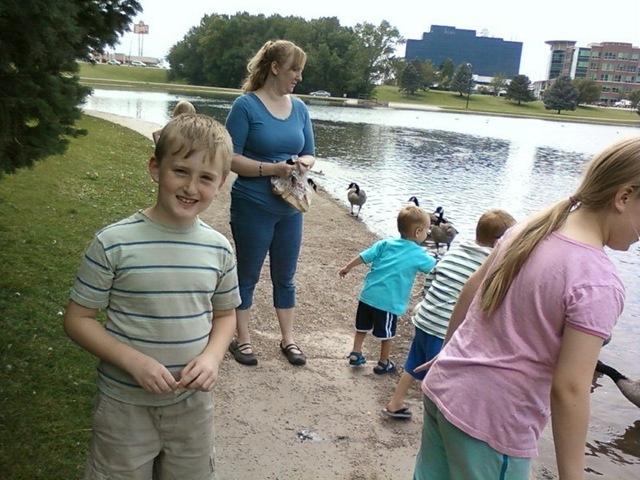 Yesterday, to celebrate and enjoy some much-needed fun and relaxation, the kids and I went with my sister Kaari and her boys to Sugarhouse Park. 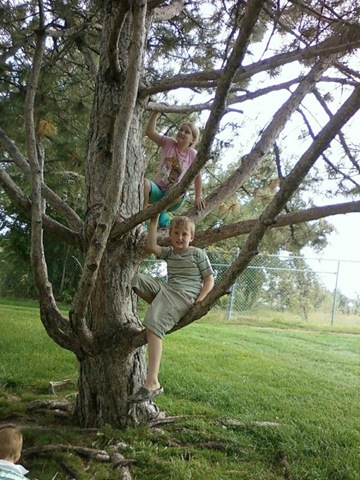 We had lots of fun playing on the playgrounds, throwing rocks in the stream, feeding the ducks/geese, and climbing trees. I’ll post more cute pictures next week but here’s a taste (and wow, can you even believe the camera quality on my new phone?!?!?!?!). And finally: for our Idaho camping trip, we’ll be in the Burley area. City of Rocks campground is mostly booked up with reservations already so if we don’t get a spot there, we’re going some other place nearby that John knows about that has tons of campgrounds along the road. If you are my friend on Facebook I’ll send pictures from my phone throughout the weekend (if I can get a signal up there).